Today I am excited to announce that IBM has generously agreed to sponsor the Artificial Intelligence site by becoming a partner with the AI community — to encourage innovation within this space by helping developers solve the complex problems facing this field. The primary focus of a sponsorship is to help bring more resources to this site. IBM is currently working with Stack Exchange to promote this site at their Winning with AI conference on September 13, 2018 in New York City. IBM will also be advertising on Stack Overflow to drive further traffic and usage back to the AI site. IBM will also bring various dev teams throughout their organization (many with communities of their own) to participate on the AI site, and to help expand awareness of the industry itself. How does a sponsorship affect this site? Site sponsorships are administered much like the "tag sponsorships" you may have seen on other sites. Apart from the visual updates and site promotion, you should not see any significant changes in the scope or the operation of this site. Site sponsorship is essentially "strategic philanthropy" where industry partners like IBM can give back to developer communities by having a presence on the site, and to provide a place to help ask and answer questions. First — sponsors do not "own" these Q&A sites. Sponsors work alongside our communities who ultimately build these sites. Communities ask the questions; communities create the tags; communities conduct elections as they do now. Any ads a sponsor might submit still has to go through our crazy-strict ad editorial process… as it has always been. Companies do not have access to personal data, and all Q&A content remains irrevocably licensed under Creative Commons for sharing and attribution. I am energized about the potential for working with companies like IBM as a way to expand our sites' growth and to help bring in new communities, and maybe even build out some new features for Q&A sites like this. Every site will ultimately benefit. On a personal note, I continue to be impressed by just how attuned our marketing team and partners have been to the concerns of our Q&A sites. We will work hard to find organizations who are willing to cede so much control back to the community. It can be difficult to anticipate all the hiccups we might encounter along the way, but we remain steadfast in the guiding principle that these ideas should NOT interfere with the main experience of the Q&A, and IBM seems to fit that relationship and expectation to a T.
This is great news. We may still be in Beta, but hopefully not for much longer! I'm taking it as a good omen that a foundational company in the field of AI wants to be associated with our dynamic and growing Artificial Intelligence stack! Is creating a new site only in this case, as a proof of concept? And then if it works, in the future existing sites will be sponsored? Otherwise I don't think I understand how sponsorship equates to "bringing resources back"; creating more sites sounds like spreading resources out or else this is more of a "we want to advance knowledge in our field for altruistic reasons" thing for companies, or is this supposed to give them a profit eventually. According to my analysis,basing on the snapshot of the site in the question body,A sponsorship generally entails enabling ads relevant to the subject and affixing a small "sponsored by..." logo in the upper-right corner, and i do think that's why ibm is here! Slight concern: Does this mean that a new moderator will be appointed in AI.SE? Some of us here are beginners and may ask apparently stupid questions and answers. The new moderator might close or delete such questions and answers. The current moderators understand these concerns and have a very good moderating policy on such type of questions and answers. Are we too fast downvoting questions, especially for newcomers? Not the answer you're looking for? Browse other questions tagged discussion design sponsored-sites . 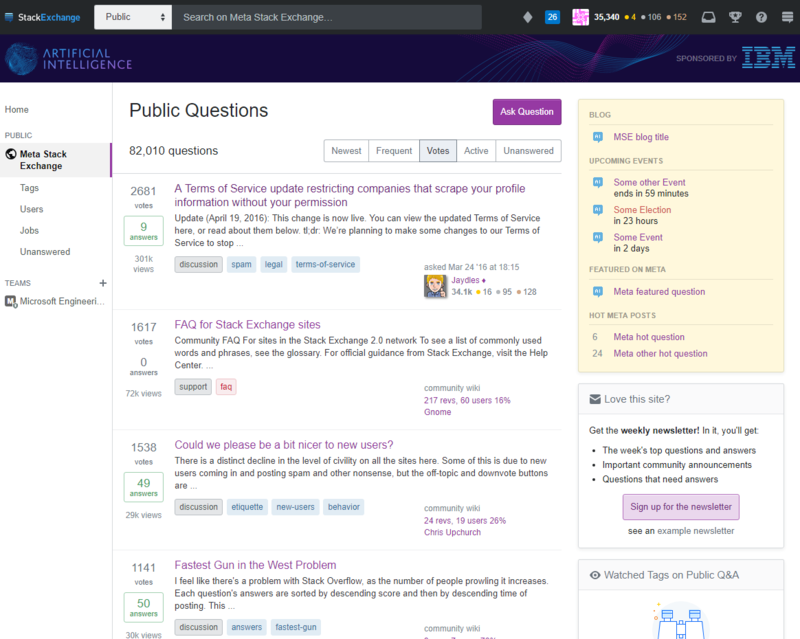 This site is for discussion about Artificial Intelligence Stack Exchange. You must have an account there to participate. Exponential growth in number of questions? Is this OK to ask questions that have been asked before on local artificial intelligence forums? Have we brought something new to the network? If this site closes, what should we do to help migratory AI questioners? What should we do about programming resource recommendation questions? Please welcome another pro tem mod! Is a question about resouces considered off-topic? Should extensions to questions be made via an edit or should a new question be posted?